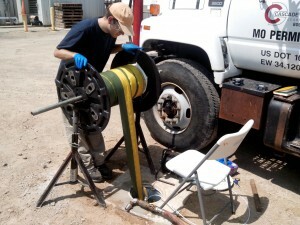 ECH Andrew Buckley during installation of a FLUTe blank liner in a borehole located at a research site in Cottage Grove, WI, USA. He is a MSc student at the ‘G360 – Centre for Applied Groundwater Research’ at the University of Guelph, Ontario, Canada. Photo: Lucas Andreata Ribeiro.